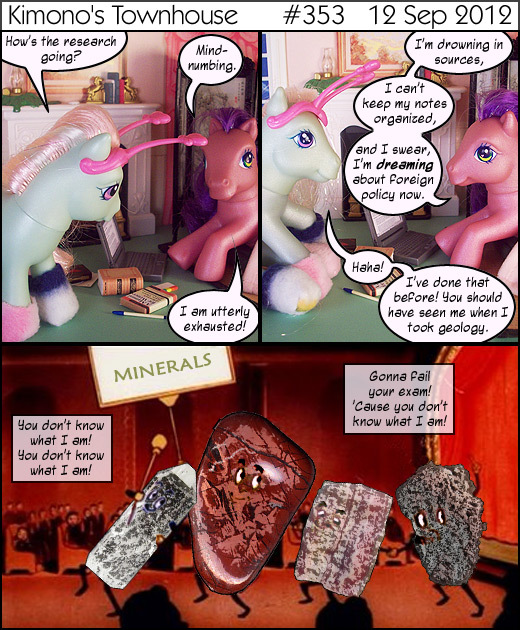 Okay, a couple of those aren't minerals. Shush. My husband is taking an intro geology course this semester. He told me he dreamed of rocks and minerals dancing around, taunting him. How could I not put that into comic form? I ask you. As I was about to say...I love how they look like a Bugs Bunny cartoon! Come to think of it... I didn't make it clear they were singing. D'oh. Maybe I'll go back in tonight and add some music notes. HOW have I lived this long, with the Internet at my fingertips, and yet never seen that before???? Poor Kimono:( I know how she feels; I graduated college over a decade ago and I still get the occasional nightmare of having a major paper/test due the next day that I haven't finished/studied for! Minty is wearing two pink and two blue socks. they are matching on diagonal feet. roflmao! While I haven't formally studied geology, I am a rockhound. This is my current favorite comic!